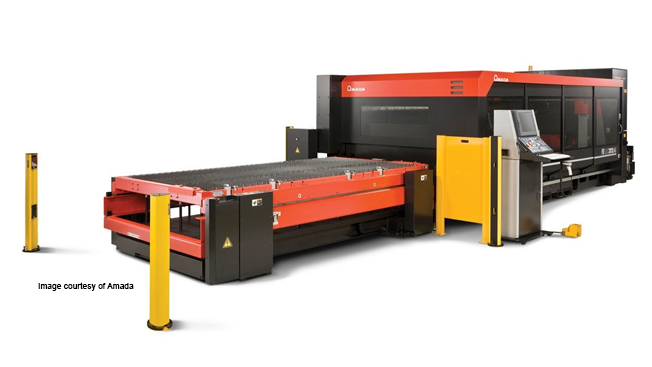 This powerful 3rd generation FO series laser cutting machine from Amada has telescopic sliding doors that give access to the whole length of the Amada FO MII 4222NT. We recommend Merry Mechanization's sheet metal software to help keep this machine running efficiently. The controller that comes with the Amada FO MII 4222 NT machine automatically regulates all of the major cutting parameters by having an integrated cutting data library. If you consistently use thin sheet metal or thick sheet metal material, this laser cutting machine is ideal because the sheet of metal stays in one place while the laser heads moves around. The CNC laser machine comes standard with laser output of 2500 W, 4000 W, and 6000 W. The multimedia network controller regulates the automated peripherals as well as the beam source and drive.